This PDF 1.6 document has been generated by TW-Brother MFC-J470DW LAN / Adobe Acrobat 10.116 Paper Capture Plug-in, and has been sent on pdf-archive.com on 11/09/2016 at 17:20, from IP address 96.32.x.x. The current document download page has been viewed 358 times. File size: 1.6 MB (51 pages). INTERNATIONAL SYMBOLS These symbols may appear on your unit or in literature supplied with the product. Learn and understand their meaning. latest information available at time of publication. THESE INSTRUCTIONS ARE FOR YOUR PROTECTION. PLEASE READ THEM CAREFULLY. FOLLOWING SAFETY INSTRUCTIONS COULD RESULT IN SERIOUS INJURY OR DEATH. cliff or ditch, or if an edge caves in. Do not use grass catcher on steep slopes. care of another responsible adult. Be alert and turn machine off if children enter the area. or interfere with safe machine operation. Never allow children to operate the machine. or other objects that may obscure vision. flammable and vapors are explosive. a. Use only an approved container. b. Never remove gas cap or add fuel with the engine running. Allow engine to cool before refueling. Do not smoke. c. Never refuel the machine Indoors. there is an open flame, such as In a water heater. gasoline to expand and overflow the tank. battery to explode causing serious injury. and keep equipment in good condition. machine to cool before storing. Never make adjustments or repairs with the engine running. wear gloves, and use extra caution when servicing them. Know controls and how to stop quickly. on the machine before starting. instructions, to operate the machine. substantial footwear, preferably steel-toed shoes. could be picked up and thrown by the blade(s). machine if anyone enters the area. look down and behind before and while backing. grass catcher or the guard in place. Turn off blade(s) when not mowing. Mow only In daylight or good artificial light. Watch for traffic when operating near or crossing roadways. Use care when pulling loads or using heavy equipment. a. Use only approved drawbar hitch points. b. Limit loads to those that you can safely control. c. Do not turn sharply. Use care when backing. uneasy on it, do not mow it. Uow up and down slopes, not across. Remove obstacles such as rocks, tree limbs, etc. the machine. Tall grass can hide obstacles. stop or shift while on the slope. or ~ights to improve stability. can ct.nge the slability of the machine. lllllllle sudden changes in speed or direction. off the~) ..t proceed slowly straight down the slope. LOOK FORDE SYIIBOL TO POINT OUT IMPORTANT SAFETY PRECAUTIONS. IT MEANS-ATTENTION!!! BECOME ALERT!!! YOUR SAFETY IS INVOLVED. Record the following information about your unit so that you will be able to provide it in case of loss or theft. tractor is not moving. If tractor is to remain stopped for more than 2 minutes, stop the engine. 1/2 inch Wrenches (or adjustable wrenches). 7116 inch Wrenches (or adjustable wrenches). 1. Head identification for each grade. 1. Remove the wooden top frame from the carton. 3. 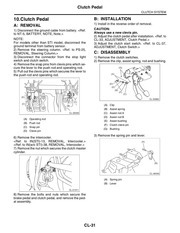 Reinstall battery (see Install the Battery paragraph in the Maintenance section of this manual). 4. Remove packing material from around tractor. 6. Raise mower deck to high cutting position. not charged to 75% of its capacity. 1. Position the front wheels straight forward. Lead acid batteries generate explosive gases. this manual) and remove the vent caps from all cells. 3. Push the steering wheel down firmly. the holes in the steering shaft. inch shank) to align the holes. electrolyte battery acid. (Follow the instructions outlined on the electrolyte package). skin when handing acid or battery. Avoid contact with skin, eyes or clothing. unleaded gasoline with a minimum octane rating of 77.
is clean and free from rust or other foreign particles. (over 30 days) of storage. Tractor section of this manual. or the clutch-brake pedal is in the ENGAGE (UP) position. each tire. Ensure that both front and rear tires are inflated properly. trying to start the engine. 1. Place the tractor so that the engine is level. 4. Reinstall the oil fill cap and tighten it securely. Get to know your tractor and its controls and indicators. of control. NEVER carry passengers. battery or the battery is not properly charged. throttle to charge the battery. run the engine at fast speed. pressure to properly operate the engine. Stop immediately and check the oil level. lights if the wrong starting procedure was used. the engine, turn the key all the way to the left. Remove the key to lock the ignition. the headlights off, push the OFF end of the switch. (the pedal should remain down). 4. Release the parking brake knob. pedal (gravity will release the parking brake). ground speed range and neutral. pedal when shifting forward gears. traveling up or down steep hills or snow removal. No. 2 range is used for cutting tall or heavy grass. No. 3 range is used for average mowing conditions. No. 4 and 5 ranges are used for very light mowing. • Cutting Height Adjustment Lever (Figure 4D) Changes the height of the cut to one of five positions. button to let the lever latch in place. removes power to the mower deck blades. position, blades should stop in a safe period of time. a roller, seeder, sweeper or other accessories. and JOU are on the seat, ready to start mowing. posllaa belal'e dismounting from the tractor. awayfnllll . . ' • ._ge chute. in the ENGAGE (DOWN) position or the clutchbrake pedal is in the ENGAGE (UP) position. cause the engine to stop. This file has been shared by a user of PDF Archive. Document ID: 00482168.